If you make a call using Zoom Phone, you can easily switch the phone call to a Zoom meeting. The other user can be on a regular phone, Zoom desktop client, or Zoom mobile app. Log in to the Zoom desktop client. Make or receive a phone call using the Zoom client. In the call controls, click Meet. The following scenarios will happen depending on whether the user is on the desktop client, mobile app, or regular phone line. Zoom desktop client: The meeting will start if they accept the invite. If the user declines, the meeting will not start. Zoom mobile app: They will automatically join the meeting using audio through Zoom Phone. Regular phone line: They will automatically join the meeting using phone audio. Three-way call (at least one user on a regular phone): All users will automatically join the meeting. Any users on a regular phone will automatically join the meeting using phone audio. 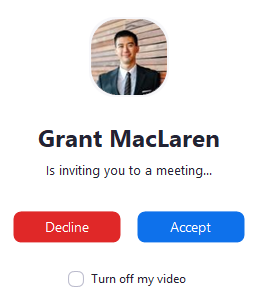 The user on the desktop client will join the meeting on Zoom. Three-way call (all users on the desktop client): The meeting will start if at least one user accepts the invite.